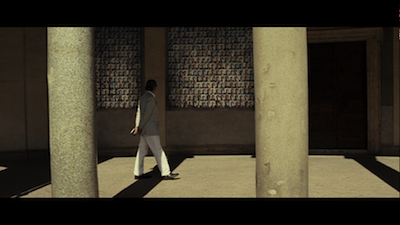 It's ten minutes into The Great Beauty that Jep appears, almost as of he is but an incidental player in the narrative. Yet, it is his story, and his birthday party when he is revealed; the man is everything and nothing. As he is introduced, an aging television presenter long past her prime, the number 65 decorating her breasts, making her a grotesque combination of birthday cake and New Year's Baby, shouts, "Happy birthday, Jep! Happy birthday, Rome!" Because Jep and his city are one and the same. The seasoned author, Jep Gambardella (played suavely and with great interior depth by Toni Servillo), is the chronicler of these tales, a watcher of all things Roman, his life and work and his society being both what he seeks and all that lends The Great Beauty its name. On Earth, he is Marcello Mastroianni from La dolce vita; as omniscient observer, he is the angels from Wings of Desire [review], careening through our collective existence, whispering in our ear. Half of those early 10 minutes are spent looking at the Roman dead while Paolo Sorrentino (Il Divo [review] establishes his visual style. The camera is continually moving. It pans, zooms, recedes, never lingering, building a kinetic memory board, as much Terrence Malick as Fellini and Wenders. The reverent journey gives way to a dance...literally. Both the gravesite and the conga are monuments to life and living, and with the author as narrator, only Jep has the ability to slow either. He first speaks to us smoking a cigarette while his celebrating guests form a chorus line on either side of him. A writer's life is reflection, even as he is busy living it. A vapid actress at Jep's party says she is retiring to write her Proustian novel; an equally empty-headed actor pretends to know what she means. It's an ironic commentary. The novelist known for his books on memory is only remembered as such, just as Jep's legacy is largely built on his earliest accomplishments. He is more than happy to remain in that moment as a creator. It gives him all the more room to enjoy the current moment. He's not chasing the past so much as he's living in a continual present, time taking on the elastic Vonnegut quality of happening for him all at once. But then, what happens when he stops moving? When the camera settles and the editor puts down his scissors? I suppose that's what the people around him wonder, and what they insist on provoking him to ask about himself. Where they fail, the milestone of 65 and the unexpected passing of his first love succeed. Jep’s book, revered as a masterwork of Italian literature, is called The Human Apparatus. It seems the fundamental question is, “How does this all work?” It’s a question Jep has never answered, as life is as fluid as the reasons he gives for never writing another novel. And as an audience, we must be fluid with him. Impressions of both the main character and of Sorrentino’s movie change from episode to episode. 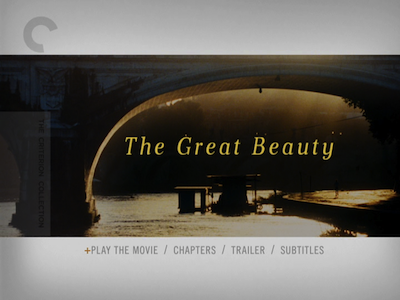 Though Jep may see all of his history as a straight line, The Great Beauty’s narrative track doesn’t really follow one. Rome is full of random encounters. 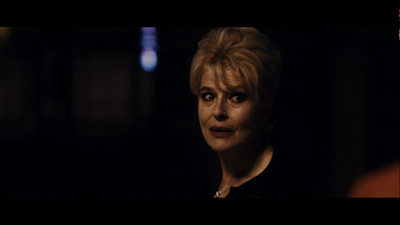 Everywhere Jep goes, he knows someone, be it a friend from three decades hence or an actress he remembers from her movies (a brief, lovely cameo by the luminous Fanny Ardant). It’s now that time and his own mortality are weighing on him that Jep is trying to put these moments together. 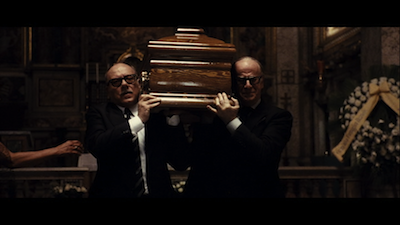 He fears there are no answers, and even says as much in a rather brittle scene with a Catholic cardinal (Aldo Ralli). More than that, though, I would argue that what Jep really fears is missing anything. A key scene is another where Jep assassinates a few characters. He’s an expert at eviscerating unworthy opponents. At one party, he dismisses a poet for having written the line “Up with life, down with reminiscence.” It’s is a line that offends him. What is life but the accumulated nostalgia? This is why his first love, the one that got away, is so important. Jep despises artists who demonstrate no insight, and people who stand for nothing. Yet, these people, these friends, labor at their pursuits, their empty politics and bad stageplays...and he just lives amongst their nothingness. His own comeuppance arrives later, when on one of his walks through a Roman relic, he stares into a metaphorical abyss to have a very real youth tell him, "You're nobody." 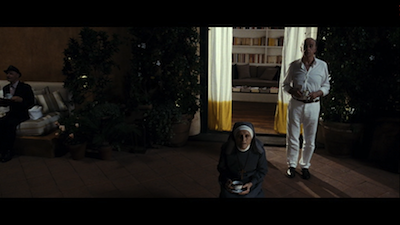 Sorrentino frames the scene so as to isolate his man: we are down, looking up, the child ourselves, faceless even when our identity is revealed later, the lens panning down from the man, past the mother, to her daughter. 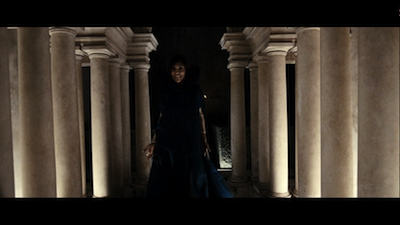 There is much we can infer from these three levels, as really there are many levels to every shot in The Great Beauty. In one interpretation, we have a construct of age; in another, we have a religious trinity. As it is above, so it is below. Two essential figures enter Jep’s mid-life to shake things up, and both bring death with them. First, there’s the one he doesn't take seriously, the troubled young man (Giorgio Pasotti) prone to dramatic gestures and quoting other writers, including Proust, about mortality. Jep’s dismissal of the boy’s difficulties and preoccupations proves to be tragic. By implication, the boy takes drastic measures in part because Jep ignored the pleas from the young man's mother (Pamela Villoresi) and gave neither of them the help they required. By the time of his funeral, when Jep tells the mother she can count on him, the hollowness of the words prove inescapable. Despite his insistence that attending the funeral is akin to performance, one where you must measure your own grief so as to not upstage the suffering family, true feeling overwhelms Jep here, and he breaks. The second essential figure is also the only one to know Jep’s stoic intentions and thus how true his display of emotion is Ramona (Sabrina Ferilli), a fortysomething exotic dancer whom Jep has taken on as a lover. The daughter of one of his oldest friends, and a woman who has seen much herself and thus earned her cynicism and distrust, Ramona represents the individuality that the rest of Jep’s social circle could be seen as lacking. Of course, then, Jep’s affair with her is branded a "disappointment" by his old crowd. The somewhat younger woman is someone who has pursued her own path with no compulsion to explain; yet the cost of this is that, despite how she presents herself, she is fragile. Not in the “tough lady is really a wilting flower” sense, but her body just refuses to cope. Still, in their time together, we get to see truly genuine affection between two people. 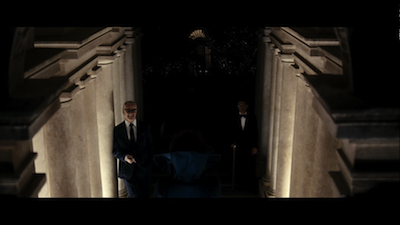 Sorrentino creates a remarkable juxtaposition when the two leave a modern art party and are granted a clandestine late-night tour of one of Rome’s most beautiful art collections. At the soiree, ironically, a little girl who is being billed as a brilliant modern artist angrily throws paint against a giant canvas as the partygoers stand agog, cooing and gasping at what they see as a gimmick, failing to see that it’s their demands and their reactions that are causing the child to lash out in this way. Her act of creation is the only genuine thing in a contrived situation. Jep and Ramona leave this gathering and, once away from prying eyes, share their own true and private artistic experience. They are ushered into a secret pocket, a place of trust. 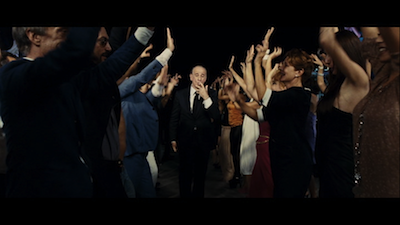 There is much in The Great Beauty that speaks to these alternating impulses, between honest expression and indulgent mollycoddling (and given Sorrentino’s extravagant style, he risks being labelled as the latter himself). Take, for instance, the two different photography projects that Jep is witness too. Both photographers take self-portraits, and both do so daily. The first is by a woman whom Jep has a one-night stand with, and she snaps the self-portraits in service to vanity, to study her fading beauty and fish for Facebook compliments. The second is done by a man carrying on a tradition begun when he is a child, a photo a day to remember, to observe, and to create and commemorate that continual timeline. Jep can’t even bring himself to look at the woman’s, but he is deeply moved by the man’s. Which is indicative of where our author eventually swings. For all the disappointments and con artists, the moments of truth win out. “The future is a marvelous thing,” Jep tells the Marxist writer Stefania (Galatea Ranzi), sharing a warm reconciliation after a vicious falling out. This is not a man who has resigned himself to the past, but is still open to the miracles of life--including a genuine miracle awaiting him just a few scenes after. “What lies beyond, lies beyond, it is not my concern,” Jep tells us as The Great Beauty concludes. It’s the beginning of the new story he has developed, the hypothetical second novel that will fill us in on all the wisdom and emotion he has accumulated in the forty years since The Human Apparatus. 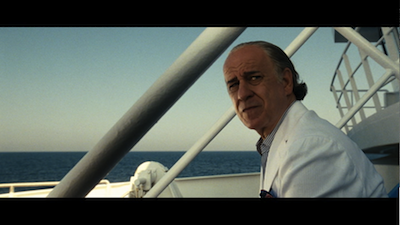 That novel ended with his protagonist giving up on love and thus life; fittingly, in the movie of his own existence, then, Jep Gambardella’s final word is “Yes.” The older man lays claim to what his younger self could not.